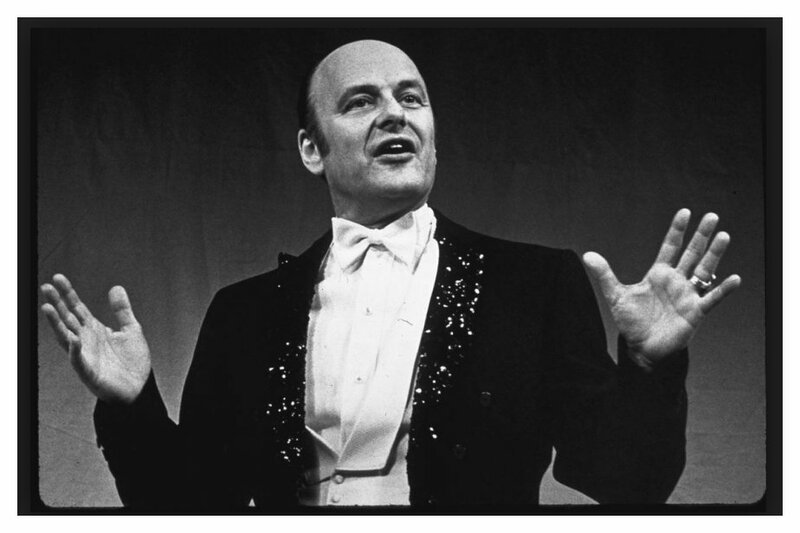 Werner Klemperer Interview with Bruce Duffie . 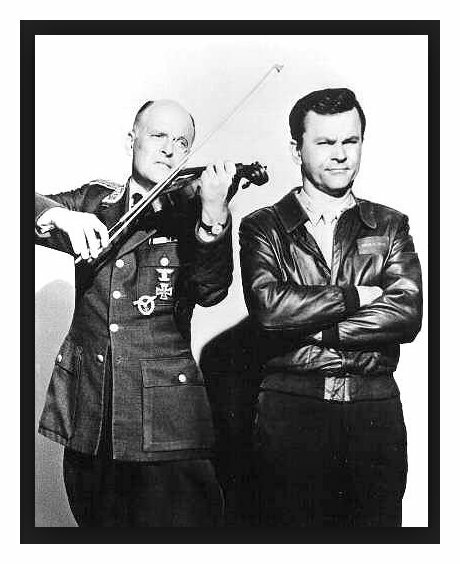 . . . . . .
Werner Klemperer, everyone's favorite TV German Air Force colonel, was best known for his role as the bumbling Col. Wilhelm Klink on the comedy series "Hogan's Heroes" (1965). 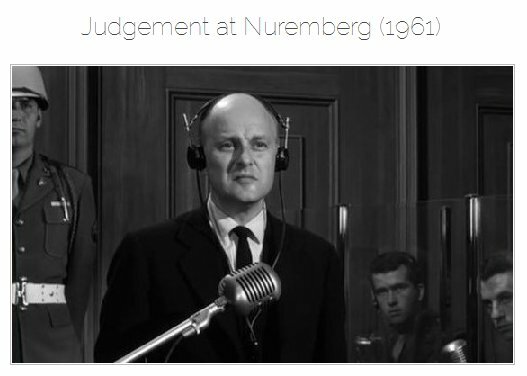 Although he'll forever be known as the blustering but inept German commandant of Stalag 13, Klemperer was in fact a talented dramatic actor, as evidenced by his acclaimed performance as an arrogant, unrepentant Nazi judge being tried for crimes against humanity in Judgment at Nuremberg (1961). 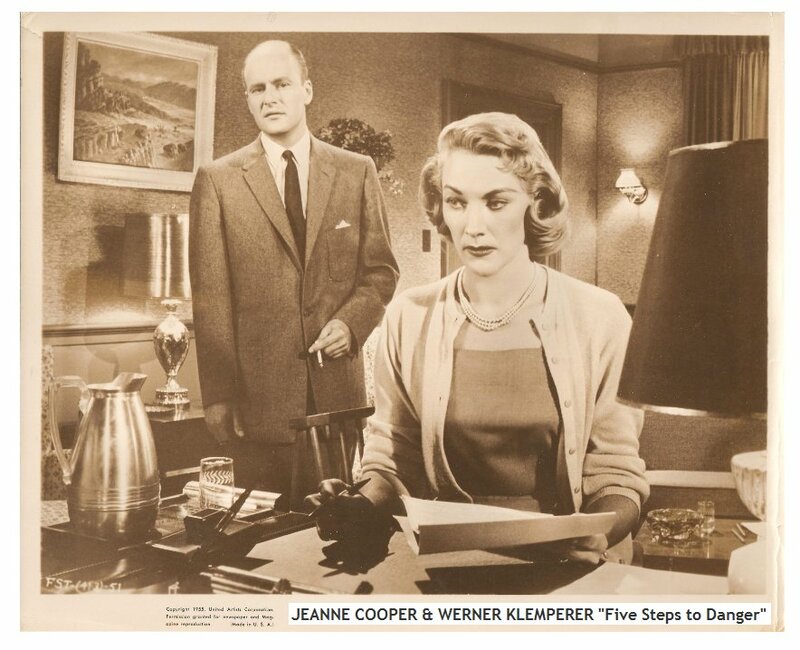 His identification with Nazi roles notwithstanding, Klemperer was in real life the son of a Jew who fled with his family from Nazi Germany in the 1930s. He served in the U.S. Army during World War II. 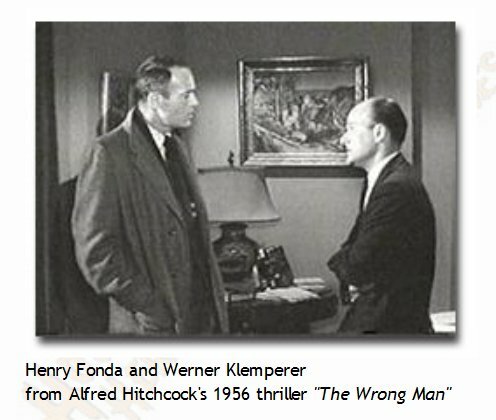 When he was offered the Col. Klink role, Klemperer only agreed to do it if the show's producers promised that Klink would never succeed in any of his schemes. 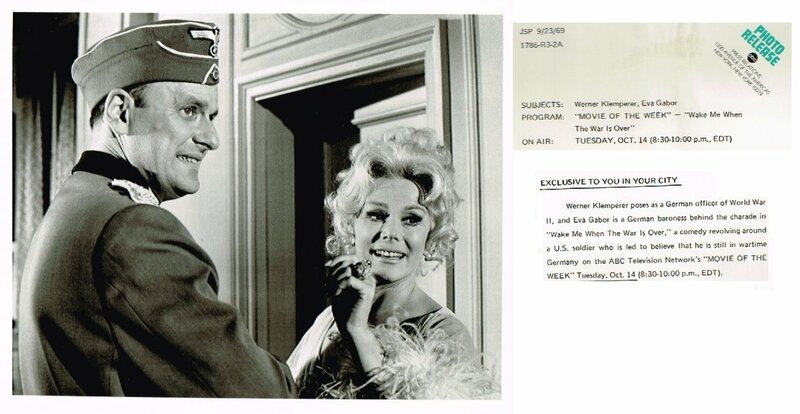 "Col. Klink" earned Klemperer five Emmy nominations, and he took home the trophy twice, in 1968 and 1969. 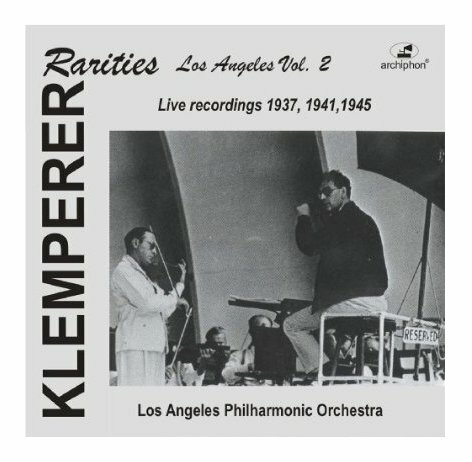 After the series, Klemperer carved out an impressive musical career as a conductor and also served as a narrator with many major U.S. symphony orchestras. He was an accomplished concert violinist. Klink's cry "Hooo-gaaann!" whenever Col. Hogan foiled him (later "Hooo-meerrr!" as the voice of Homer Simpson's conscience). Served in the U.S. Army from 1942-1945. He conducted the Buffalo Orchestra. Son of conductor Otto Klemperer. 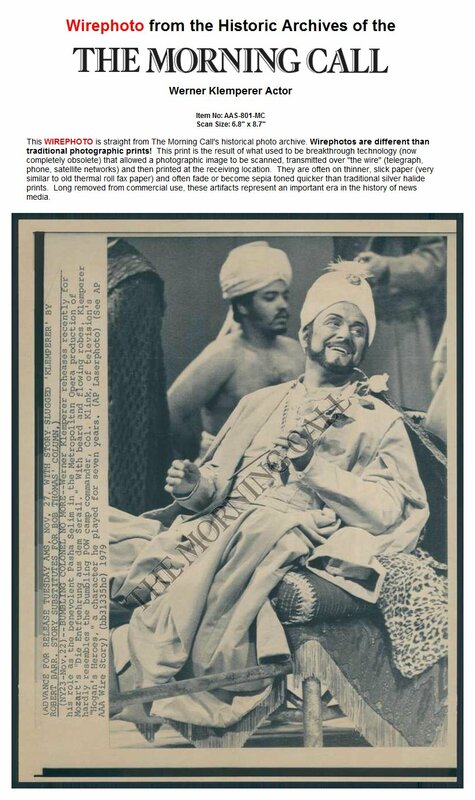 He appeared as Pasha Selim in the Mozart opera "The Abduction From the Seraglio". 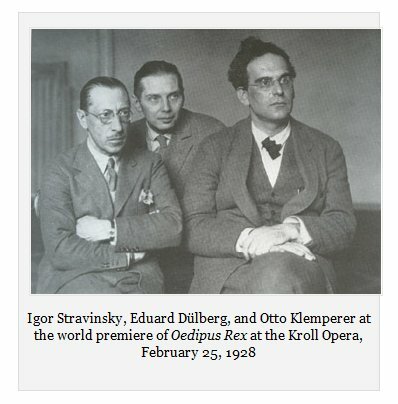 Klemperer also appeared as a narrator with nearly every major symphony orchestra in the United States. His repertoire included such works as Beethoven's "Egmont" and "Fidelio," Stravinsky's "L'Historie du Soldat" and "Oedipus Rex." One of his favorite works was as narrator in "Peter and the Wolf," which he performed at Carnegie Hall in New York City. 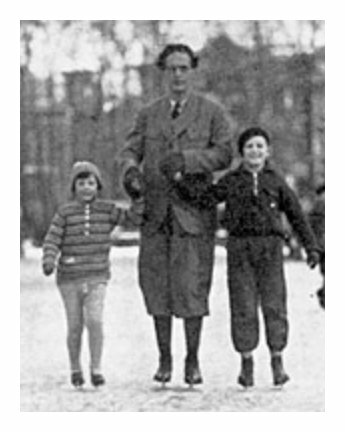 Although he was most famous for playing a colonel in the German Luftwaffe (air corps), Klemperer's family were German Jews who fled Nazi Germany in the 1930s. 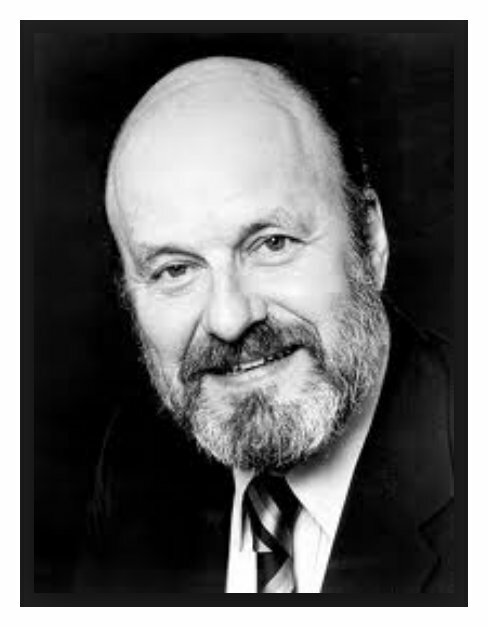 For many years, he served as an elected member of the National Council of Actors' Equity Association, the Union of Professional Actors and Stage Managers in the United States. Immersed himself into teaching himself English so completely, that he found himself actually thinking and dreaming in English. Was nominated for Broadway's 1988 Tony Award as Best Actor (Featured Role - Musical) for a revival of "Cabaret." 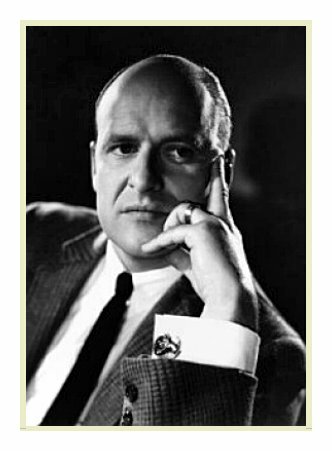 Is portrayed by Kurt Fuller in Auto Focus (2002). His last acting role was as Colonel Klink, his most famous character, on a 1993 episode of "The Simpsons" (1989). 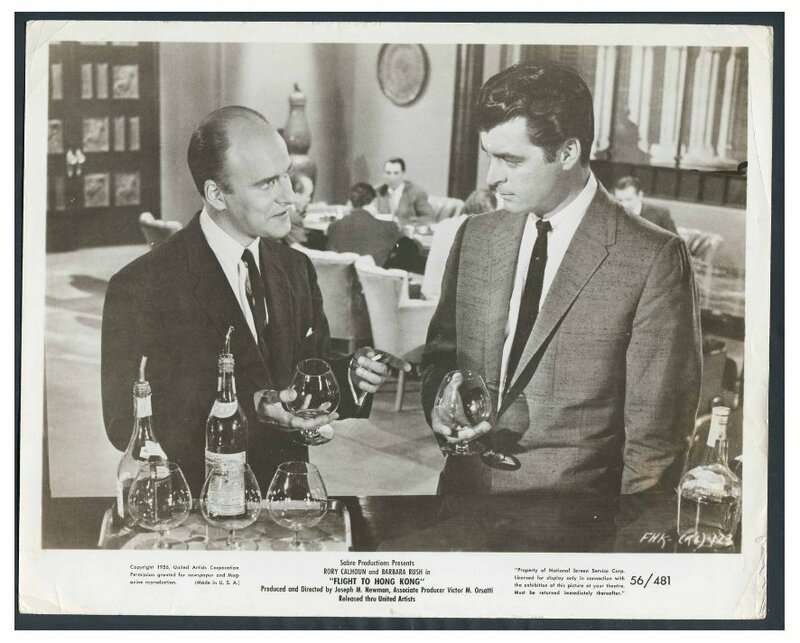 During World War II, served in the U.S. Army and was assigned to Maurice Evans' Special Entertainment Unit serving with fellow actor Carl Reiner. 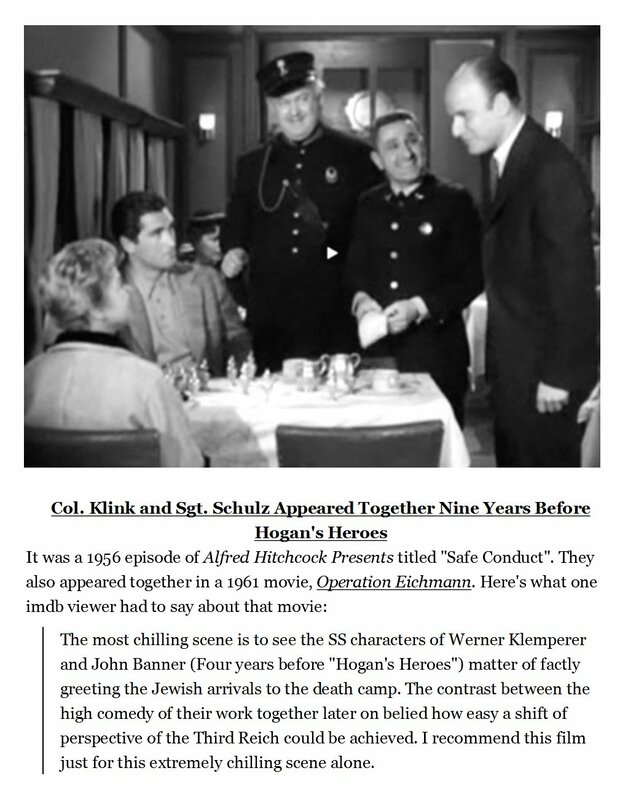 Klemperer agreed to take the role of Col. Klink in "Hogan's Heroes" (1965) only on the condition that none of Klink's schemes would ever succeed and that he would always wind up looking foolish. He was nominated for a 1975 Joseph Jefferson Award for Best Guest Artist for his performance in "The Great Sebastians," at the Ivanhoe Theatre in Chicago, Illinois. During his guest appearance on "The Pat Sajak Show" (1989) he was presented with a monocle by Pat Sajak, as the host had learned that Werner's original monocle from his "Hogan's Heroes" (1965) days had recently been taken from his personal collection. He made guest appearances on both of the longest running prime time dramas in US television history: "Gunsmoke" (1955) and "Law & Order" (1990). 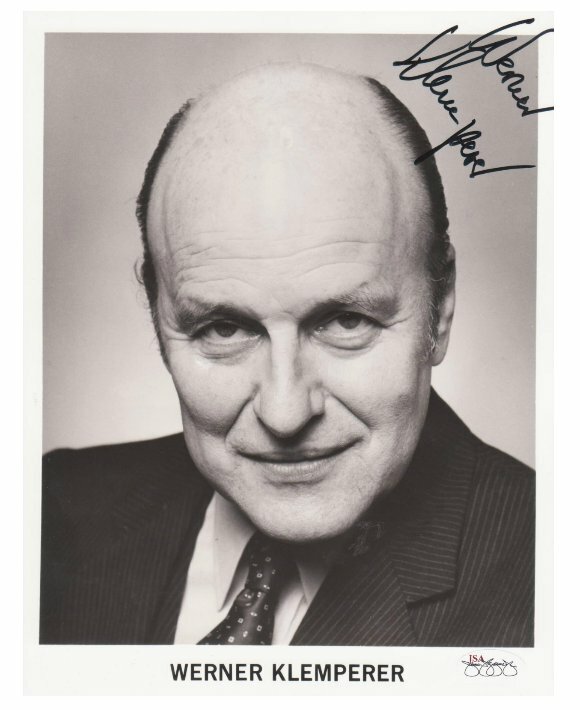 It was in July of 1985 that Werner Klemperer permitted me to call him on the telephone for an interview. By that time in my career, I had already spoken with many of the greater and lesser lights of the classical music field, but this was my first encounter with someone who was so familiar to the general public. I need not have worried, however. He was a stern taskmaster, and responded to my questions with directness and authority, but he put me at ease immediately and we did have a wonderful conversation. He was pleased that I wanted to know so much about his own career and interests, especially the parts away from the famous TV series. A larger accounting of his life and accomplishments can be seen in the obituary which follows at the bottom of this webpage. We began with his recollections about his famous father, the well-known and much admired conductor Otto Klemperer . . . . . . . . .
Bruce Duffie: Let us start with your father. I assume that you saw him conduct at least some operas and concerts? 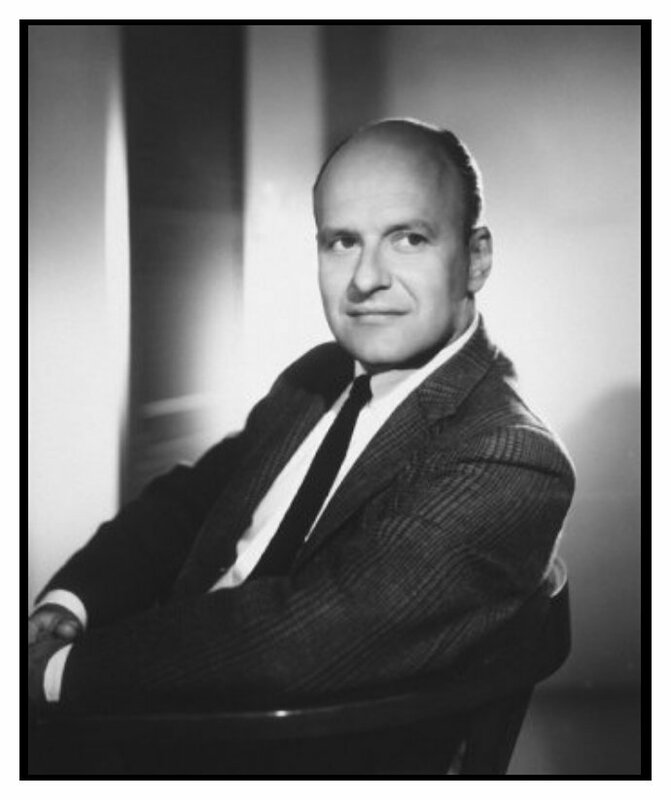 Werner Klemperer: Actually, interestingly enough, my relation to his actual work did not really come strongly until after we came to this country. When we were children in Europe, we were not allowed to go to anything because we were too little. The educational process was somewhat more rigid than it is here. So it wasn’t until I was in my later teens that I began to have a relationship to his music. BD: In effect, really, it would almost be better, because you have to wait until that time to understand what’s going on. WK: Absolutely. I had very few experiences when a child, but it all started in Los Angeles, really. We went regularly to the Philharmonic concerts, so I heard a variety of things. It’s very hard to express those kinds of reactions, except to say that he had a very profound influence on me as far as musical tastes are concerned, and certainly as far as some interpretations are concerned. It’s hard to really put it right down to a particular piece or something. You can’t really do that. BD: Did you enjoy his concerts more than those conducted by others? WK: That, too, is difficult to answer. As I grew musically, I began to make choices on my own. As a matter of fact, I’ve never quite been asked that before. I can say in that retrospect, not because he’s my father but just as to my interest in music, that he is a most important, very profound musician, and that in a large amount of the cases I prefer his approach to composition. BD: Do you find that is still true when you listen to his recordings? WK: Yes, I find that there is much in certain composers that I would rather hear him do than anybody that I can think of. BD: When you were growing up and he was home [see photo at right], did he talk about his music at all, or when he came home, did he divorce himself from the music, and talk about other things? WK: The conversation was not about that, no. BD: Did you see him conduct opera, or just concerts? WK: I’ve heard him conduct opera, but that was late — that was in the ’60s. BD: Did you go with him at all to Budapest? WK: I did not hear or go to Budapest because I was very involved as an actor here in America, and I had no opportunity to go there. I did not hear him conduct the Kroll Opera in Berlin because I was too little. I do remember a dress rehearsal of Falstaff when I was a child. I do have a bit of a remembrance of that. But I heard his Fidelio at Covent Garden in the ’60s, and that made a very profound impression on me. BD: Since you saw it on stage and you have the LP, is the recording a good representation of his thoughts on the opera? WK: Very much so, in my opinion. BD: I just wondered if anything got lost in the vinyl someplace? BD: Let me ask you about the narrator in Oedipus Rex of Stravinsky. Did your father give you any information on that, since he did the world premiere? 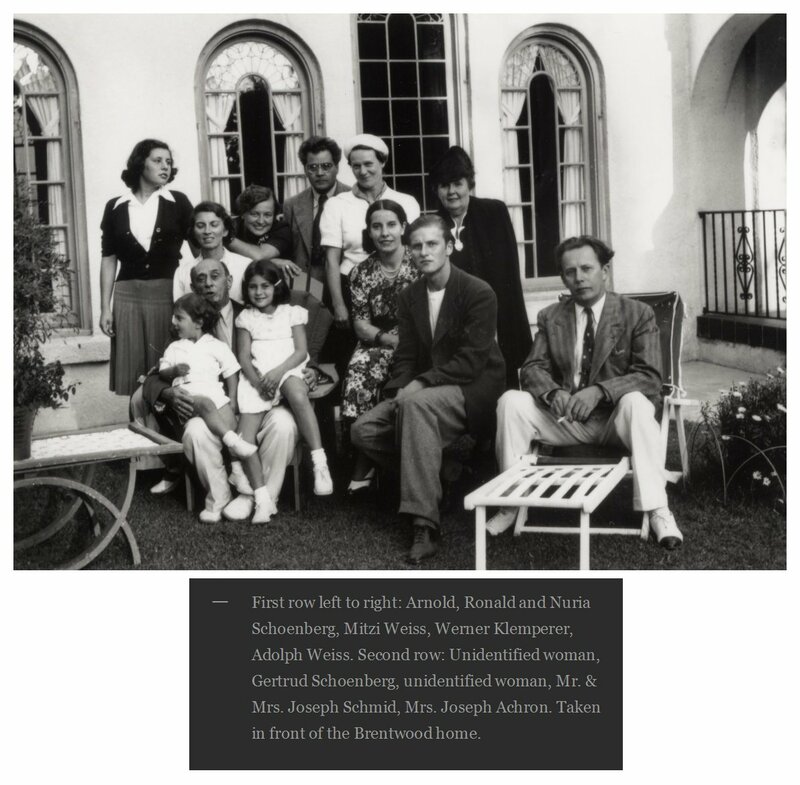 [See photo at left] Were you working on that while he was still alive? WK: No, my father died in 1973, and it was just about that time that I just began, very slowly, to do some of that work. As a matter of fact, it was even a little later than that, so he did not have any participation in that at all. BD: Were you able to go through his letters and documents or his score to get help on that? WK: No. No, I did not. BD: Did he see you on the stage and on television? WK: Yes, he certainly did. BD: Did he approve of you as an actor? WK: Very much so, yes. BD: Rightly or wrongly, you’re going to be most remembered as Colonel Klink in Hogan’s Heroes. Did he see any of that series? WK: Yes, yes, he saw a couple of episodes of that in Switzerland. He found it very amusing. That’s about as far as he went. It wasn’t shown there. Through CBS I had a couple of episodes sent for him to look at. BD: But he was happy at your success in it? WK: Oh, I think so, yes. He was always very interested. My father was a very theatre-oriented man, and he was interested in everything that was connected with the stage. So he was obviously very interested in my work. BD: When you were first developing as an actor, did he encourage you to continue in that? WK: Yes, he did. I started out at the Pasadena Playhouse in Los Angeles. I went to drama school instead of college. BD: Was there ever any pressure on you to become a musician rather than an actor? WK: Oh, not at all. I’m very glad about that, because that made it possible for me to have the profound and deep love and interest I have in music grow naturally. No, there was no pressure, thank God. BD: [Laughs] Do you think that people who are pressured to go into music get a slanted view of what music really is? WK: No, I don’t mean to say that, necessarily, but if a person is forced, through parents, into a profession that they don’t necessarily come to completely by themselves, that could be harmful. BD: Are you, yourself, good audience? WK: I’m a very good audience, yes. I listen to music. It would be very hard to explain to anybody how I listen to music, but it is a relatively profound process. BD: Without naming specific names, are there conductors today who do stir you as much as your father did? WK: Oh, boy! I have been stirred by other conductors, and I’ve had moments when I’ve listened to music of other conductors where I became extremely involved, yes. BD: Did you ever hear any of your father’s compositions? BD: What or who were the major influences on his writing? WK: I certainly think that if there’s one composer that must have influenced my father’s composition, it was Mahler. BD: Oh, of course, yes. Mahler was a big influence on his life all of the way through. BD: Did you ever see his opera? WK: No, it was never produced. BD: It has still never been produced? BD: Is there any chance that it can be? WK: Oh, I have no idea. No, I don’t think so. BD: I just wondered if you could lobby the management of the Met to do it. BD: Do you think the opera house in general is too much of a museum? WK: I’m not a good one to ask because I haven’t seen the work of that many opera houses. No, I don’t think the opera houses are museums. Sometimes some of the productions that are done are like museums, yes, but in the main, I think opera houses all over the world — not only in Germany or in Austria or in some of the other European countries, but here in America too — are trying to develop. BD: It seems that especially the large houses always tend to do what we call “standard operas,” and they don’t seem to be nearly as adventurous as either the smaller houses here, or even the Kroll Opera. WK: Well, I think that adventurism, not only in the arts, but other things, is not exactly the sign of our times today. BD: Then how can we get opera houses and audiences to be more adventurous? WK: I think we have to change our whole attitude about our society and about our governments, and about our way of living. I don’t know how that’s to come about. Those are major questions. BD: Some of the recordings that were made by the Budapest radio of your father’s performances have now been released. WK: You mean by the Budapest Opera? I’ve heard some of them, yes. Some of them are absolutely marvelous, except that the sound quality is not very good. That could not be helped, obviously, but I think that they are very interesting. BD: So you feel, then, they should be released, even though the sound quality is less than ideal? WK: Anything that was done by him or other conductors like him should be released because it’s of interest to people who are interested in music. I see no reason why they shouldn’t be released. They have to be released as a kind of a historical document because their quality is just not that good. BD: So the audience, then, has to be prepared for what they are going to hear? WK: Absolutely! We do have old recordings that we treasure, and it could be like that, too. The outstandingly interesting thing about that period of his life was that he really conducted things much faster in those days. BD: Is this better, or worse, or just different? WK: It’s different. In the first place, I don’t think there is much merit in the expression, “fast or slow conducting.” It’s either right or it’s wrong. It can be slow and it can be exactly right, and it can be fast and it can be totally boring. I don’t think fast, as to slow, is a value judgment that fast is better than slow. It’s ridiculous. It’s perfectly possible for an artist to conduct Beethoven’s Fifth in one tempo in one part of his life, and in another part of his life in a somewhat different tempo, and be right on both occasions. BD: As the artist matures? WK: Well, no, I don’t think maturing has anything to do with it. Human beings, people, are not the same any given minute or second or hour of their lives, and everything is related to ten million other circumstances. It’s like an actor can’t give the same performance every night. It’s impossible, and it shouldn’t be. BD: For you as an actor, then, do you enjoy the things you have done, or do you wish you could go back and tamper with some of the tapes, or some of the performances to make them a little better? WK: I try as hard as I can not to use the words “better” or “worse” too much. I would prefer to use “different.” Have you had the opportunity to get a hold of the digitally remastered items? BD: Yes. Angel has just been putting them out, and we have aired many of the recordings. BD: Do they sound a lot better to your ears? WK: I think so. I speak from a technical standpoint only, now. They are remarkable! That process is a miracle to me. I think it’s wonderful. BD: Ah, good. We enjoy them in the studio, and when we play them, they do sound better and brighter. Is that sort of like touching up and brightening an old painting? WK: No, I don’t think so, because an old painting is an old painting is an old painting. BD: But an old record is not an old record? WK: An old record is not an old record is not an old record, because as it gets older it really falls apart. But the painting really stays with a certain preservative on it. But we have reached a point where we can literally get rid of things in a recording and make it come back to what it really sounded like at the very beginning, and I think that’s miraculous! BD: Was your father happy with the recordings he made? WK: He didn’t listen to too many of them. He was never very much in love with the process of recording. It didn’t appeal to him. He hated the idea of having to stop and go. BD: He would have been much happier in the studio today, where they have the long takes. WK: Well, he had long takes because he insisted on them — to the chagrin of the engineers. [Both laugh] But he did long takes. He wasn’t one of those people who could take out a note here and a bar there and re-record it and put it in. He hated all of that. BD: So he was giving a performance? BD: [Laughs] You mean he wasn’t human??? WK: Well, he didn’t say he wasn’t human, but he felt that by being so perfect technically, that it lost something that was real. If you get so inwardly excited about what you are doing, you are vulnerable to a slip. But if you are a perfect machine, there are no slips. Do you understand? BD: This seems to be a common complaint today, that many of the new performers are too perfect, and lack the heart that is necessary. WK: I won’t say lack the heart; I just say too perfect. I let the rest of it stay on its own merit. BD: Let’s move on to your own thoughts, then, on opera and concert. For people who are perhaps addicted to television, and who watch Hogan all the time, how do we get them into the concert hall or into the opera house? Should there be a constant audience-building? WK: In the first place, we have a very large concert audience in America today. The educational process for music is always important and should always be stressed, and we should always try by all means that are at our disposal, whether it be through educational institutions or community efforts or professional orchestras. Whatever it is, we should try and gain more people who will come and participate, and I think that process is growing in America. You have a lot more people going to hear what’s called “classical music” today than you did thirty, forty years ago, and I think it’s very good. BD: How much can the performer expect of the public, if anything at all? WK: I don’t think the performer should expect anything of the public. The performer’s job is to go out and perform. All I expect from the public is to relate to what I am doing, and to hopefully find something in it that’s worthwhile to them. I don’t think it’s the performer’s job to educate the public who are coming to hear him or her. It’s the performer’s job to do the performing. I think that there are other people that need to do the educating. The people who put it all together, they need to see to it. BD: Then let me turn the question around. How much can the public expect of the performer? WK: They can expect the absolute best, and if they don’t get it, then they should ignore him. BD: [Laughs] So I assume this is what you strive for all the time, the absolute best? BD: Well, we hope so. Is there enough drama in the opera today, is it theatrical enough? WK: It depends on the opera. Some operas are more theatrical than others. I don’t think there should be any effort made to dramatize opera more than it is. Whatever it is, it is. It depends on what the opera is, and your job as an interpreter is to try to make it livable and real for the audience. WK: The age of the director? Yes, that may be true — the director and the scenic designer, certainly. BD: Are they getting too much power? WK: Too much power? Oh, that’s so hard to judge because opera in different parts of the world is still treated so differently. Opera at best is a very difficult medium to put together in a proper way. It’s very hard because it combines so many elements. It’s very hard. I think that whatever an audience goes to hear and see and accepts easily, then it’s right. BD: So then the public is always right in its determination? WK: The public is always right in its real reaction — not necessarily in its traditionally asked-for reaction, but its honest reaction, yes. BD: Let me ask you about a couple of your roles. You’ve done Abduction from the Seraglio. Tell me about the character of Pasha Selim. WK: The character is quite obvious. He’s an autocrat, almost a dictator kind of person because of the way that the governments were run in those days. He does really love Constanza, and that’s basically it. BD: Then why does he let his compassion get in his way, and he loses her? WK: That is difficult to answer because he’s an Eastern-oriented individual. BD: So in order to really understand him, you kind of have to understand the Eastern philosophy? WK: I think so. The production we had at the Met was a very fascinating one, and it was a terrific experience for me as an actor to not only be in that production, but to be working in that house. BD: Was it at all different for you because you were not singing, the Pasha being a speaking part? WK: It was different because I’m not singing, but it was like going to school. The entire time that I was there, I was in that house from morning ‘til night, going to rehearsals and other operas and educating myself. It was wonderful! BD: So it was kind of a crash course in the operatic tradition for you? WK: It sure was. It was marvelous! BD: What else did you learn besides just your part? WK: I learned how an opera house is run. I learned how they do these things. It was fascinating, absolutely fascinating. I learned how to do a lot of things and how not to do a lot of things. BD: [Laughs] Sometimes that’s more important, how not to do things. Are these lessons that you can, then, transfer to your acting career also? WK: Very much so. Of course. There’s a certain tradition that still remains as to the acting behaviors on the opera stage. If you are a good actor, you have to find a means to break that and still be in the ballpark. It was very interesting. BD: So acting on the opera stage was different from other kinds of acting? WK: It is, to some degree. Luckily we had an English director who was basically a stage director, John Dexter. That helped a great deal. BD: Did you find the house was at all too big, speaking to four thousand people rather than just twelve hundred or so? WK: No. If you have a good vocal instrument, if you can speak well, as any stage actor should, you can be heard anywhere. BD: Would it have made any difference to you if it had been performed in English? WK: It was in German. The Metropolitan Opera does virtually every opera in their original language. BD: This brings up one of my favorite questions. Should opera be done in the original, or should it be done in translation? WK: Well, my answer is very simple and very quick. I know it’s open to much discussion, but I think it should be done in the language of where it’s played. BD: So then in New York it should be done in English? WK: That is my opinion. BD: Why are more operas not done in the language of the audience? WK: [Sighs] I think that there are two reasons. There is one reason that’s given, and there is one reason that’s not given, in my opinion. The reason that’s given is that when the music was written and the lyrics were written in the original language and they are more singable that way. That’s one reason. The reason that’s not given is that the singers don’t know all of the languages. In other words, the big fight is, experts, or so-called experts say, “If it’s written in Italian it’s only singable in Italian, because when it’s translated it’s too difficult.” Well, I think you have to make adjustments because it’s more important that the person who walks into the theater understands the words. WK: I am about to do it. I live directly across and I could almost touch the opera house where it is being done, and we are going over there to see one. I have not seen it yet, but everybody that I have talked to has said it is just simply wonderful. I think that’s a great idea! BD: Is that the ideal compromise, then? WK: I think it’s a hell of a compromise, yes! If you are going to pay forty or fifty dollars for a seat, don’t you think it’s fair that you understand the story? Seems to me pretty fair. BD: This goes back to my question of how much the performer can expect of the public, and their preparation for an opera. It’s always been known that you have to do a little more preparation for opera than you need to do for a musical or a straight play, just because of the language. WK: But it is my opinion that you should not have to do any preparation for any of those things. It should be natural, and you should go into that house and understand what’s happening. BD: So then you’re saying the performers should do all of the work involved to put it across? WK: That has nothing to do with the performer. That has to do with the guiding spirit who decides which way it’s done. The performer will do it the way he is told to do it. BD: So we go back to management, even. BD: Then how do we get wrong-headed managements to do more things in translation? WK: I don’t know. I guess the public has to revolt. BD: Go on strike, and not come back until they get it done in the vernacular? WK: That’s right. [Both laugh] That will be an interesting development. WK: I must tell you I can’t answer that because I really don’t know. I think that opera is here to stay, quite obviously, and I think that—I don’t know how optimistic I am about new operas, but I certainly think the standard opera will stay. I don’t know enough about opera, really, to judge that. We certainly still seem to be lacking in this country, what I call a real opera sense all around the country. I mean, when a city like Los Angeles, which is one of the biggest cities in the country, doesn’t have their own opera house, I think it’s pitiful. I think it’s sad that we haven’t reached the point where we have more opera, but we don’t. BD: So there should be more all over the country? WK: Regional opera is strong, I know, but that’s it. BD: You’re involved with the Young Musicians Foundation. Tell me a bit about that. WK: Yes. It’s a wonderful organization. It’s been in existence for about 26 or 27 years, and its purpose is to help young, gifted musicians gain opportunity for performances, public performances, professional performances. We give them grants; we give them scholarships; we have one of the five best youth orchestras in the country; we have a training program for young conductors. It’s an outstanding organization and I am the outgoing president. I was the president for a couple of years and I’m now on the board. I have not been able to give much time to it in the last year because I have been otherwise involved, but it’s an organization that I will continually try to be helpful on because I think they deserve a lot of help. BD: Are there enough young musicians today to fill the demand? WK: There are always young, talented people coming up, and they need help because they often don’t have the financial funds, the ways and means to get ahead. This is the kind of organization that does that. We have a national competition for violin and piano and cello. There is another part of our program called Musical Encounters in which we send our youngsters into the junior high schools and the high schools to work with their peers who are taking regular music classes. That’s a marvelous program! BD: So you feel more should be done at the public schools and at the younger ages? WK: Oh, I feel it’s very important. At home and in the schools — that’s where it all starts. BD: Do you feel that opera or concerts belong on the television? WK: Yes, I think there is a place for it on television, particularly now that our new sets are going with the stereo sound. Opera has done a great big giant step through television with some of the performances that we’ve seen, and it’s gotten a lot more people interested. There again, they had the subtitles, if you remember. BD: Is that going to help prepare the people, to see the subtitles then in the house? WK: Yes, absolutely. Also, for instance, The Ring that was done by Chereau on television got people closer to The Ring that never would have come to it otherwise. BD: Even though it was a somewhat controversial production? WK: I don’t know what you mean by controversial. It was interesting. Obviously, it will be controversial if it is interesting, because if the man has something to say, people are going to dislike it. BD: You feel that if productions are worthwhile, they will always be controversial? BD: I’ve gotten that magazine for many years for the cartoons and for the musical reviews at the back. WK: You will be interested in reading that. He’s a good reviewer. BD: I like him. I learn a lot from him. BD: What’s the role of the critic or the reviewer? WK: I think the role of the critic is to criticize and to stimulate. [Laughs] He has to have, in my opinion, an incredible background, which is already a failure of most critics, and he has to be a real musician or a real theater man. He has to have studied the fields thoroughly, and he is to illuminate what took place, whatever he reviews. He should stir people into interest, whether it is negative or positive, but it should be of interest to them. He should not be a destroyer, yet he should not be a person who only wants to say good things. He should be a criticizer. BD: I’m afraid that’s one of my failings when I go to the theater. I always find things I like, or at least I try to find things I like. WK: In the main, I try to, just literally, go with as open a mind as I can. It’s very hard, of course, not to be pre-judging and then seeing what happens. BD: Is going with an open mind easier when it is something you have never seen, rather than something you have either seen or done yourself? WK: That’s very hard to answer. I don’t know because we get so used to certain things, and then if it isn’t like that we don’t like it, and that’s very bad. BD: I just wondered if you went, perhaps, to Oedipus Rex or Abduction from the Seraglio just as audience. WK: I have that problem with music a great deal, only because I expect certain things for myself, and when they are not forthcoming I am disappointed. But one shouldn’t, really. One should take it upon its face value. BD: Let me ask about another role that you have done, Prince Orlofsky in Die Fledermaus. WK: Yes, which is usually sung by a female. BD: How did you wind up with the part? WK: I don’t know. [Both laugh] I think it’s fine that it’s done by a man. Why not? The character is a man. You can play him many ways. I played him as a sort of a decadent, hedonistic kind of fun-loving poop. BD: [Laughs] Was that your idea, or the director’s idea? WK: That was my idea. BD: What do you do if you get a director that doesn’t like your ideas? WK: Then, I have to try to adhere to much of what he wants. That’s what I’m hired for. If you are an actor and your director has a way of going, then if you signed your contract, that’s what your job is. You can always try compromises and talk about it, but you have to adhere to the director. BD: So he is the final boss? WK: Well, absolutely! And should be. BD: I have talked to many opera singers, and occasionally you find some who don’t think that way. WK: I wouldn’t think that was occasionally; I would think it was more often than that. BD: [Laughs] True, I was being a little more diplomatic. Of course, in the opera house you have one more boss — the conductor waving the stick. WK: Yes. The musical director and the stage director should be of one mind, if possible. Then everything will fall into place, but that’s all ideally spoken. It doesn’t work that way in today’s market. I know all that. BD: It just happens once in a while, and that’s all? BD: You were lucky enough to have that for your Orlofsky. WK: Oh, we were very lucky, yes. I’ve done it twice, in Seattle, and in Cleveland. BD: These were staged performances, of course. Let me ask, does opera work in a concert version? WK: Yes, it works if you don’t have the money to stage it. It can be done, and has been done successfully. It can be very effective if it’s done with good singers and everything. If it has too much spoken dialogue in it, I don’t think it’s ideal, because that means playing it, more or less. But a lot of operas lend themselves to this quite well. BD: Were these performances of Fledermaus in English or in German? BD: Would you have accepted them if the contract had stipulated German? WK: I would have considered it, depending on where it was, sure. BD: I usually talk to singers and ask them this question, but as an actor, how difficult is it to say no to a part? WK: Well, I can answer that question very quickly, and that not only goes for actors, it goes for all performers. You ask them how difficult it is for them to say no? It depends what the size of their bank account is. [Both laugh] If they are very poor, it is harder to say no. If they’re not so poor, it’s easy. That’s a frivolous answer, but that has a certain amount of truth in it. Otherwise, it depends on what you are after in your profession. If you are after a certain kind of career that goes in a certain line and has a specific goal to reach at the very, very end of the tunnel, then you have to be very careful in what you say yes to and what you say no to. If you don’t, or if your career means to you that you want to work as much as you can in different phases and keep on working in that way, then you have a different attitude. So that all depends. BD: I guess it would be different, though, for an actor. Very often I ask this of a singer because when they sing different roles, they can hurt their voices by singing something that is too heavy or too long for their instrument. BD: Do you enjoy doing that kind of thing — the narration of Egmont and so forth? WK: I love it! Yes, so much so. BD: As an actor, how have television and films affected your performance, and theatricality in general? WK: Most of us are stage actors. Everybody you see on television and film — certainly if they are over thirty years old — has had some stage background because that’s the only way to become an actor. Television and film are a different medium because you work with a mechanical object, as opposed to speaking while being in front of a live audience. But it’s an interesting technique. It can be very satisfying at times. Unfortunately, most of the material is not too great. BD: [Laughs] Let me return to my earlier question. Are you optimistic about the future of television? WK: I think the future of television is big. Yes, I do. There are a lot of things that are lacking right now, particularly in the sitcom field, but I think that certain areas of television are simply immense in this country. I speak particularly about news; I speak particularly about the documentaries; I speak particularly about anything political; I speak particularly about sports, and to some degree I speak about a certain amount of dramas, but after that it’s downhill. But the field is wide open and the possibilities are very big. I think it’s going to grow and grow and grow. BD: Do you think there is a chance there will be sitcoms as brilliant as Hogan again on television? WK: I don’t know about that. 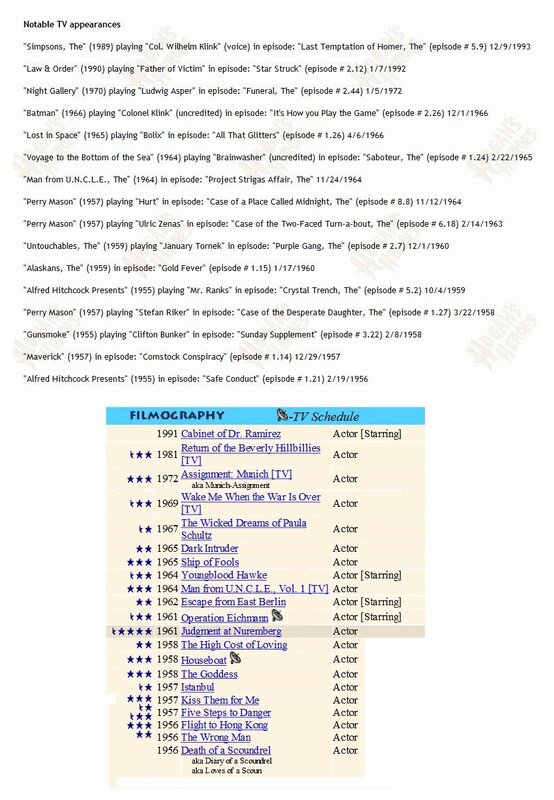 The days of the Lucy Show and Hogan and M*A*S*H and the earlier ones — other good ones I mean — it’s going to take a while. Everything seems to be very imitative now. I don’t know when that will happen. Maybe we don’t need that anymore. I don’t know. BD: Is it comforting to you to know that Hogan will probably last forever in syndication? WK: It doesn’t really make any difference to me. It’s nice to have been connected with a show that has become sort of a classic, and I suppose it will last for a long, long, long time, and that’s okay with me. I look at my work as you do one thing, and if you do it well and it’s over, then you go to the next. I don’t linger. BD: Maybe this is what causes the public a little confusion, because they don’t see it as ending as long as they can see it. They can see it every night on television, so it’s not ending. It’s always there. WK: Why should that be confusing? BD: You go off and you do something else, but they still think of you as doing Hogan, when in fact that was a previous part of your life. WK: Well, that’s possible and it’s understandable, and there is nothing I can do about that. The media is such that it precludes that kind of progress. There is nothing I can do about that. I just have to keep on doing the work that I am asked to do, and do it as best as I can. BD: You enjoy the work that you are doing, of course? BD: Good, good. Thank you for being an actor, and thank you for bringing all of the ideas and insights that you have to your acting, and at least a little bit into the opera house. And I certainly thank you for spending some time with me on the telephone today. This interview was recorded on the telephone in July, 1985. Portions (along with recordings) were used on WNIB two months later, and again in 1990, 1995 and 1999. The transcription was made and posted on this website in 2013.